Men and Women in Black or Do They Wear Tan? We have wondered for many years who and what these unusual people are who come to us at unexpected times, usually following some sort of UFO/ET event. Important to note is the fact that these events feel so very unusual and different, or have some odd aspect to them and therefore remain extra clear in our memory. The times I have interacted with these characters, everyone was quite different. I am still not sure what I was supposed to take away from the encounters so I am leaving that to the reader. About 5 years ago now, on Christmas Eve, my mom and I drove to the shopping mall to pick up some stocking stuffers as last minute gifts. The sun was setting, but had not reached the horizon yet. The sky had that “wintery look” if that can happen in Florida. It was a cool day and the parking lot was quite empty. I was able to park 3 vehicles down from a side entrance door to J.C. Penney’s. The rest of the building was a brick wall, an outside sidewalk, and the parking lot. The lack of crowds at this location was why I chose to enter there, shop, and leave. It was a long walk on either side to reach the back of the mall entrance and another shop had we chosen to visit. Mom and I entered the store and immediately spotted what we wanted to purchase, walked to the cash register and stood in line in front of 2 other women who were on the same mission we were – last minute gifts. There was one cashier waiting on us. There was no one else around until the door we had entered through opened and two tall blond women walked in pushing an “umbrella” style stroller; the type that had no spaces for baby accessories such as a diaper bag. The women appeared to be twins with long hair parted in the middle. They were dressed in black pants with dark tops, no buttons or jewelry. They slowed down next to us and nodded their heads as if indicating they wanted us to look at the baby in the stroller. This is where my mom and I both felt odd. The “baby” was covered up to the neck with a plain colored blanket. Only the head, which was the size of a large orange and appeared to rest on top of the blanket, was visible. It had no hair, no visible ears, mouth, or nose. There, looking up at us, were huge slanted almond shaped black eyes. “Is there something wrong with that baby”? Its eyes were too big and it was too small to be staring at us like that”. I walked quickly down the main isle, then turned right into the children’s department we knew the blond women had pushed the stroller down. There were no other people in sight. This was a small department so when I walked in, I could see all around. The women and stroller were nowhere to be seen. They were just gone. The only exit was the one they had come through as we had. I rushed back to my mom to discover everyone was back in motion. The lady in front of us was paying for her items; the woman in front of her had already gone. I asked her if she had seen the blond women and told her they had to be twins. She did not know what we were talking about. We asked the cashier and received the same response. This situation became even stranger as my sense of reading my surroundings was confused or contorted somehow, as was my mom’s. We both left through the same door we had entered approximately forty minutes before. Mom continued repeating her question to me: “What was wrong with the baby”? When Mom gets nervous, she laughs quietly. She had begun to snicker. Mom stepped off the wide sidewalk to the road and began to cross and headed for our car. She is tiny and could walk faster than me. I was also carrying our bags as I moved toward the curb. I heard my name called, turned to look over my left shoulder and there, leaning against the brick wall just a few feet from the door, stood 3 men in black suits. They had hats on, sunglasses, and one briefcase sitting on the sidewalk. These men were all different heights. “You are never to tell anyone what you were just shown while you were in the store”. Do you understand”? I felt unsafe, and had a strong desire to get to my mom so I turned, walked off the curb, and headed toward the car. I asked my mom if she saw the men and she said yes, and asked what they wanted. I looked back to see that the men were gone. There was absolutely nowhere for these black suited men to go because the door had been locked behind us for the night, we could see in every direction and these men would have to walk quite a way to reach the parking lot at the other end of the building. We would have spotted them leaving. Where did they go and who were they? This is one example of the typical Men in Black encounters that have been reported by so many; but, there are also Women in Black Encounters as well. How many are experiencing the Women in Black? I had been having ET experiences once again following a quiet time of approximately 2 years. One, in particular, involved an ET in my home and a possible abduction. I was questioning and thinking about some new concepts and I feel this may have triggered a “visit” early on that Sunday morning. The event I explain next also occurred several years ago. We were all in bed sleeping. My daughter loves to sleep in the living room on weekends where she can watch TV on the large screen. She was there this particular morning when the doorbell rang. 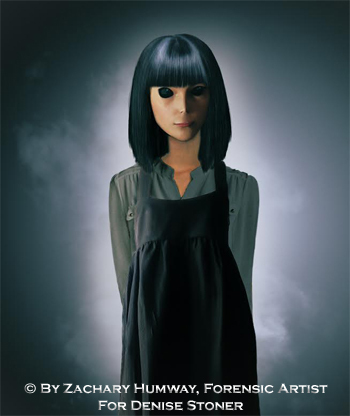 She knows not to answer the door to strangers and she could see an odd looking woman in our monitor with black hair, straight bangs and large black eyes, with a shorter, twin version standing next to her, just barely visible in the lower corner of the screen. We did not have a video recorder set up yet. My daughter called out to me through the bedroom door and by that time the doorbell was ringing over and over again. I was startled awake as I sleep heavier in the morning than during the night. I jumped out of bed and ran through to the front door. I looked at the monitor and saw a woman with shiny black hair that was cut in a straight bob with bangs. I also saw the same version only shorter, standing next to her. They were wearing beige blouses with jumper style dresses that were not quite black and loose from the shoulder straps down. I could not see their feet or arms clearly. The tall one was carrying something like a business folder under her left arm. I looked away from the monitor down to the door handle and opened the door. I just caught the figures of these “women” as they disappeared by fading away while still in the parking area in front of my home. There was nowhere for them to go by running or walking without being seen and I am positive I watched them turn from solid figures, to transparent, to just plain gone in a two second time frame. What did they want with me? I have no idea. They wanted me to see them, obviously. Were they sending me a message or warning because of the recent events in my life? I don’t know as I never received a message from these women. I contacted a very good artist friend of mine to have a portrait painted of them right away so I would have a forensic view of these individuals before they faded from my memory. Soon after this encounter, I discovered other people have had experiences with these Women in Black. Lastly, I want to include this experience since it appeared and felt like some sort of strange “watcher” or “Man in Beige”. I feel this also needs to be addressed. On more than one occasion, I have had the opportunity to run into this unusual man or men. I have always had these encounters at one particular health food shop here in my town. I would say at least 3 times, perhaps 4, when I stopped by for lunch during Florida’s beautiful fall/winter season so I could sit outdoors. Each time, I had the same exact series of events occur. I sat at the same table outdoors on a corner sidewalk which gave me a complete view of the parking lot on both sides of the shop, cars, and entryway of the store. There was a decorative support beam to my right shoulder cemented to the sidewalk and ceiling of the store overhang. It was about 1 ft. by 1 ft. square all the way around. It did not block my vision when people passing by walked on either side of it. Directly across from my white iron table – which was openly carved and atop a pedestal – and in my line of vision just a few feet away, sat a man dressed completely in pale beige. The material was a gauzy, perhaps cotton, tropical looking outfit. He also wore a straw hat in the same color. The shirt hung loose over his pants. His hands and face were almost the same color as the clothes he wore. He had some fuzzy looking hair sticking out from under his straw hat. His facial skin was sort of doughy appearing as if one could push it into different shapes like kids’ play dough and unhealthy in appearance and color. He wore sunglasses with yellow lenses and his eyes appeared to be slightly larger than normal and dark under the glasses. I could tell he was staring directly at me. It was actually too cold out to wear that type of clothing so he was totally out of place in the setting. Everyone else was enjoying a late fall day in Florida, finally a day for light sweaters. The tables were in the shade under an awning each time I went. Again, I don’t like the heat and therefore only ate there when it was late fall or winter so I could sit outside. He had a thick, medium sized notebook on the table in front of him along with a glass of water. He never had food of any kind even though he arrived after I sat down with my lunch. He did not open the notebook or drink from the glass of water. I discovered I had difficulty looking away from him although that could be because he never took his eyes away from me. I could “feel” him staring at me. I looked away to pay attention to my meal but felt compelled to look back at him. My husband was sitting to my left side and I told him about the man, described him and asked him to turn slightly sideways in his chair so he could look. He did so and agreed that this man was staring at me – not paying any attention to my husband. When we were almost finished with our food, this man stood up, picked up his notebook and very slowly began to walk toward our table. He took his eyes away from me. He passed our table and then behind the support beam. Just as he stepped by our table, I could have touched his shoulder as he was only inches from me. I watched, expecting to see his back as he continued down the sidewalk or the parking lot where his vehicle might be. To my surprise, I could not see him once he passed me. He was neither on the sidewalk or in the parking lot, nor did he enter the store because the only entry was to my right and to the left of the support beam. He was gone! This same scenario played itself out over a period of years at least 3-4 times. I have no idea what the purpose was, who he was, or what the message to me might have been, if any. The only thing I knew, without a doubt, was the fact that I was being observed and during this observation, I felt compelled to watch him watching me, return his intense stare, was hyper aware of his appearance, behavior, and the matter of his odd departure. Where did he come from? Where did he go when he left? Was he demonstrating that there are other dimensions? Parallel worlds? Was he from another place and time? I have no answer. He did not “feel” malevolent. I felt no fear nor did I have the desire to leave in a hurry. I have done much thinking about these encounters and wonder if he was extracting something from me to understand who, and what I was all about. I had reason to go back again after the last sighting and park directly across from the table I preferred. Mine was the last car in the row next to a patch of grass and cement trim. When I left, I saw that there was a car nose to nose with mine. Not in the same condition... and it was covered with what is referred to as “Angel Hair” . I attempted to capture a sample and every time I tried to collect some, it just disappeared. I could not feel it with my fingers when I touched it and it would not rub into or on to a collection vial I always carried in my purse. It was not hot or cold. The whole car was covered. When I arrived home, there was not a sign of this angel hair substance. I have not seen the man since then, and the store has now been closed for many years and a new business has not opened in its place yet. 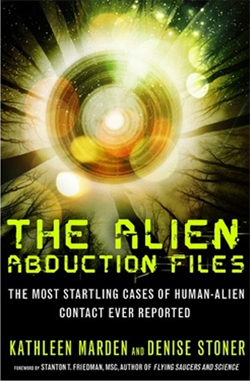 Denise Stoner has been active in the UFO field for over 20 years. She is the Director of the Florida Research Group, an affiliation of UFORCOP. She is a member of MUFON’s National Abduction Research Team and is also a Florida MUFON Field Investigator and Star Team Member. Prior to her current positions, she was a Florida MUFON State Section Director and Chief Investigator. Denise holds educational forums for public and private gatherings for abduction experiencers. Denise Stoner began her research in hypnosis under Dr. Bob Romack, in Denver, Colorado. They worked together for five years on pain control, smoking cessation, and past life regression research. Denise also worked as a paranormal investigator in the homes of abductees who felt they had been visited by spirits following abductions. 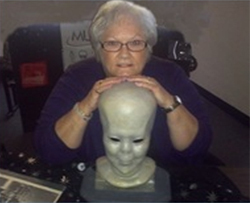 She recorded evidence of the development of psychic abilities in individuals following their experiences with UFOs and ETs, and worked on a Team with Dr. Romack studying abductees’ abilities to locate missing people and predict future events. For 12 years Denise conducted background investigations for the military on recruits seeking highly classified clearances for work on nuclear submarines. Prior to retirement, Denise moved to the Naval Air Warfare Center, Training Systems Division military research facility where she was the training coordinator for several hundred military and civilian employees. Denise Stoner is also a retired S.C.U.B.A. instructor, cave diver and former research member of the National Speleological Society Cave Diving Section. Her retirement from the Federal Government has allowed her to expand her work with UFO research and investigation. Denise has appeared on TV and has participated in many radio shows. She presents yearly at the Daytona Museum of Arts and Science and the Paranormal Investigative Association, as well as other venues. She has worked as an on-camera expert for documentaries produced in the UK and is currently moving forward with several exciting new projects. Denise Stoner’s Hypnotist certification was earned through Hypnosis & Regression Training at the Hypnotic Research Society by Dr. Ronald P. De Vasto, and she has taken advanced regression studies through the National Guild of Hypnotists, Inc. headed by Donald J. Mottin.